Q. Can you print our logo on anything? A. As well as our vast range of over 90,000 promotional products, all of which can be branded, we can print your logo on virtually anything. The size, shape and material of an item determine the branding methods and print area possible and we recommend sending your artwork at the earliest opportunity so we can advise on the best way to reproduce your logo. Q. What type of artwork files can you accept? A. Vectored EPS or PDF files are ideal, but we can work from all file types. It may take a little longer to process your order if our studio has to redraw non-vectored artwork. Q. Will you send an artwork proof before printing my items? A. We always send an e-proof for your approval before starting to print your order. Allow one or two days from receipt of your confirmed order and artwork to produce your proof. Printed pre-production samples are available, at cost, for large orders. A. Origination, or print set up, is the charge to produce the tool or screen which will be used to print your logo onto the items. The type of tool required and the cost of producing it depends on the branding method being used. Repeat orders without any changes to the artwork usually have a reduced origination cost, or none at all. A. We can provide plain unprinted samples of all of our products so you can see and feel them for yourself. We can usually send lower value items free of charge, and higher value items on a sale or return basis. Printed pre-production samples are available, at cost, for any bespoke or very large orders. Q. How long will it take to produce my branded promotional products? A. The lead time varies for different products. Many popular items are available on an express service from as little as 24 hours production time, with the average lead time being around two weeks from artwork approval. Bespoke items however, can take considerably longer. Let us know if you need you items for a particular date as we can usually squeeze orders with tight deadlines into production schedules. Q. How will my items be packaged? A. Most items will come individually boxed or bagged, please contact us for details of particular items. We can create bespoke packaging and mailing boxes all printed with your logo to maximum the branding potential of your promotion. A. Yes. Please contact us for a free copy of our current catalogue. Q. Can I really challenge you to find any promotional item? A. Yes! 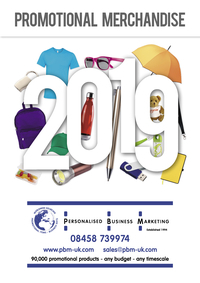 As well as the thousands of products on our website and in our catalogue, we supply a huge range of over 90,000 products. We can also print your logo onto virtually anything, so why not give us a challenge?